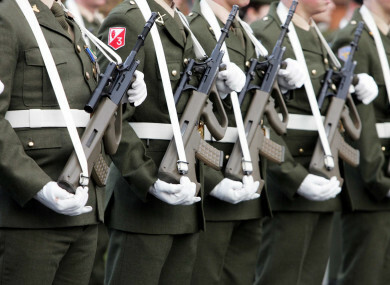 Poll: Do you want Ireland to sign up to the EU defence deal? The Taoiseach has said the deal will not affect Ireland’s neutrality but opposition TDs think otherwise. THERE HAVE BEEN numerous concerns raised in the Dáil over the Cabinet’s approval for Ireland to join Pesco, the EU’s new defence pact. Some argue Pesco is the first step towards an EU army, with its proposals including inclusion in the European medical command, a network of logistic hubs across Europe and a creation of a European crisis response centre, as well as the joint training of military officers. The Taoiseach, however, has maintained that signing up to the deal will not challenge Ireland’s neutrality and will not mean Ireland joining a European army. Varadkar said that Ireland can join in an opt-in, opt-out basis. The opposition meanwhile said that a vote on the matter was rushed through the Dáil in a “deeply cynical” move. So, today we’re asking you: Do you want Ireland to sign up to the EU defence deal? Email “Poll: Do you want Ireland to sign up to the EU defence deal?”. Feedback on “Poll: Do you want Ireland to sign up to the EU defence deal?”.